Want to know what the most frequented blog post is here at Brimful Curiosities? My review of the Despicable Me: Sleepy Kittens Book has received numerous hits every single day since it was posted in July. Everyone seems to want to learn more about those kittens! I secretly think the sleepy kittens might be more popular than the Minions that star in the film! Well, then again, maybe not. The Minions have been making appearances all over as of late. Did you see them in the Macy’s Thanksgiving Day Parade on the Statue of Liberty float last week? 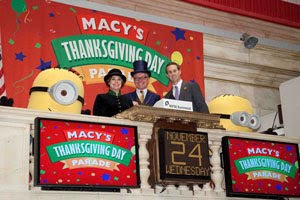 Some hardworking Minions also helped ring in opening bell at the New York Stock Exchange last Wednesday. 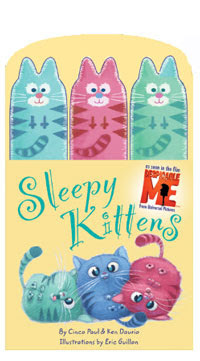 If you didn't win a copy of Sleepy Kittens in my last giveaway, here's another chance! 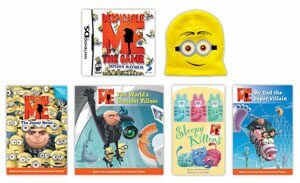 Thanks to Universal Studios, Brimful Curiosities' readers can enter to win a Despicable Me Prize Pack. To enter, leave any comment relevant to this post. Did you see the movie this summer? • Contest ends on Monday, Dec. 13th, 2010 at 11:59 PM CST. My husband and I saw the previews, and I was astounded that he actually said he wanted to see the movie! I haven't seen the movie yet, but can't wait. My kids have been asking to see this ever since they saw the previews, but alas, we still haven't seen it! Such a great movie! I went to see it twice. We still haven't seen the movie and my husband and I were so bummed when we weren't able to make it to the free matinee showing of it at our local theater last month. Looks like we'll be renting it. I know my 3 boys would love the movie and this prize pack! We wanted to go and see the movie this summer, but never made it. Can not wait to see it on DVD. Thanks for the fun. I thought I had left a comment before my retweet post... Anyway, we saw the movie on Monday and loved it! We wanted to see the movie this summer, but somehow never made it there. Something we are reminded of every time we go to the movie, with the pre-movie clip they've been showing lately of the character from Despicable Me cleaning the screen. My kids have been constantly bugging me about not going to see it- but I am hoping that eventually it will be in stores for a price I can afford. I did not see it this summer, but I would like to. I subscribe to Brimful Curiosities in my Google Reader---and love it! I have not seen the movie, but it sounds fun and this would make a great gift for my niece. My eight year old daughter would love to win this. We haven't be able to see the movie yet but I already love the minions! My friend just told me yesterday they loved this movie and I should see it with my kids. Greatest show ever!!!! "it's so fluffy I want to die"!!! We saw the movie at the drive-in this summer and loved it! We're excited to see it again when it comes out on DVD! I'm following Despicable Me on Twitter @MommaStaciA. I didn't get to see the movie, but I am eagerly anticipating the DVD release. We have not seen the movie but would love to! We haven't seen this yet, but we'd like to. No I have not seen the movie . I follow Despicable Me on Twitter. I follow you on GFC as LUCKYLADY42. I did not see the movie but hope to rent it. I myself didn't see the movie, but my kids did and loved it. Thanks so much for this giveaway. My daughter went to see Despicable Me with her girlfriends. I'd like to win this for her because she LOVES her Nintendo DS. I took my niece & nephew to the movies and didn't expect to like it as much as I did. I thought it was better than Toy Story 3! I laughed harder at this movie than I ever have at any in my life. I think I enjoyed the film more than my kids did! I haven't seen the movie yet. I need to rent it. I haven't seen it yet- I'm looking forward to renting it next week! My son loved this movie! Yes, we all went together to see the movie & we all loved it. It's on all the kids Xmas lists. I saw the movie and I love it. THANKS for the AWESOME GIVEAWAY!!! I liked Despicable Me on Facebook. THANKS for the AWESOME GIVEAWAY!!! We did not see it this summer, but we are waiting for it to be out on dvd. Yep saw it twice in the theater and LOVED it. I have not seen this "yet"...but I do have the Blu-ray on pre-order. We have seen all the trailers and palyed some of the online games and just love the Minions and Gru. I have not seen the movie yet. I think they had the strangest way of promoting this movie. I saw so many ads run across my favorite shows that by the time the movie came out I was sooo over it already. Now that it has been awhile I am ready to see it. yes I did see it and loved it. My two little grandsons saw the movie and loved it. We will be buying the DVD. I personally didn't see this movie but my hubby and kids did. They liked it a lot! Didn't see the movie but prewiev was great. I posted a comment answering the question before my extra entries so posting it again (please discregard if it shows up twice). The week we were supposed to go see it, my son got sick. We never got to reschedule another time to go. It looks like a great family movie and on the list to pick up for the holidays. Yes, I took my nephews to see it at a drive-in movie theater. We loved the movie and the atmosphere! I'm also a Google Friend Connect follower of your blog! (Amanda Davis) Thanks again!! No, I haven't seen the movie yet. I WILL be renting it from Netflix. It doesn't work going to a movie theater with Husband. He falls asleep 5 minutes into the movie. I haven't seen this movie yet but I want to! My kids saw it, but i missed out. I haven't go around to seeing this movie yet but hope to soon. Thanks. I haven't seen the movie yet. I would have went when it came out but I don't really care for movie theaters. I usually wait for it to come out on my premium movie channels. thank you for the opportunity to win. I haven't seen the movie yet but the prize goodies are adorable—please enter me to win! i did see the movie. it's super super cute. I haven't seen the movie yet. I usually don't see movies until they come out on DVD. The previews I saw were cute. Would like to win this giveaway! I haven't seen the movie, but I did see the float in the parade. My kids and I loved this movie! They've been asking me for the DS game. I like Despicable Me on FB. My daughter and I saw "Despicable Me" while on vacation this summer. We had a blast! My daughter would love to win the prize pack and wear the minion hat to school!!!! Haven't seen it yet but I crack up at the commercials. Can't wait for it to come up on my Netflix! We did go see the movie and it's awesome we love it!!!! The whole family saw the movie. My daughter loved it. No, I quit going to movies years ago...too much money. I enjoyed this movie when we saw it this past summer! My kids are really wanting to see the movie...and, honestly, i do too! I saw the movie in theaters and loved it! Dispicable Me looked like a very funny movie. I missed it in theaters, but we've already pre-ordered it, so I'll get to see it in a few days. Thanks for the giveaway! We loved the movie. Thanks. We saw the movie this summer and it was great. I loved the sleepy kittens part. Thanks! Our family had planned to see it in theaters, but were so busy we didn't get around to it. I will be renting it on DVD though, and maybe buying it if we love it! My kids ended up seeing this with their friends so I haven't been able to see the movie yet, however, we've set this movie for our monthly movie night next weekend! It's too expensive to take my family to the theater so I haven't seen the movie yet. Such a cute, heartwarming movie. We saw it in the theaters this summer and everyone really enjoyed it.